Why do we usually sneeze more than once? Why do we usually sneeze more than once at a time? Ginny - I tend to only over sneeze once, but my boyfriend always sneezes 3 or 4 times every time he sneezes. It's quite interesting, different people do seem to sneeze differently. 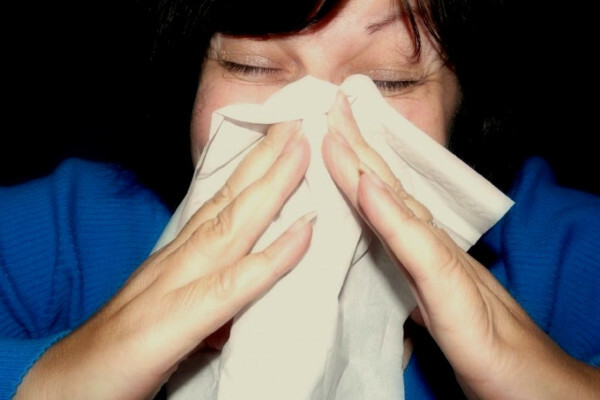 Sneezing is a reflex that occurs in response to a stimulus, some kind of irritant, something annoying, entering the nose. It's semi autonomous which means that although it is a reflex, we do have some control over it, so you can sometimes manage to stifle a sneeze, but it can be quite tricky to do that. So, it can be a normal irritant like dust, pet hair, some kind of virus or microorganism. But in many people, including me actually, sneezing can also be triggered by bright lights. So if you go out into the sun. Chris - Ah, the photic sneeze reflex! Chris - Yeah, we've talked about that before. Ginny - [Non-photic] sneezes are triggered when a particle of some kind makes contact with your mucus membrane and then that sends a signal to your brain and the response is this very dramatic sneeze which actually uses a whole load of different muscles because you need some muscles to brace yourself against it. Otherwise, you go careering across the room when it happened. It doesn't really seem to be understood why different people sneeze differently. There may be a genetic component, there usually is to these things. I found one thing that said that it may be more common in allergenic individuals, so people who are responding to chronic irritants - irritants that are there all the time. So if you've got hayfever or if you've got pet allergies, you may be more likely to sneeze lots of times in a row. Previous Why don't my sat nav and speedometer agree? Next Do pilots consider Earth's rotation?